For what it's worth, people just have to credit me for raising a reader in my firstborn. But these days, I am just so tired at night to read long stories to him so when I saw these, I immediately bought them. And these books teach about measurements and grouping and nature. And they're pretty short but really interesting stories. 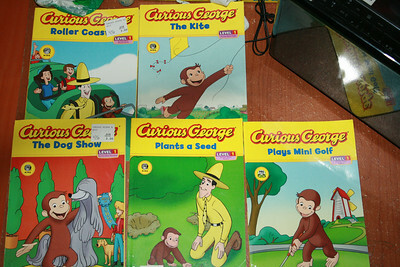 I have been resisting the purchase of Curious George compilations because I just know Yakee would try getting me to finish the book and not settle with just one story from the book. That's how am sneaky. Ahehe. This sneaky post is making me giggle! Because I do it also! Whenever it's book reading time, I'd be sleepy while reading before my kid.